Queen Victoria was the daughter of Edward, the Duke of Kent and Princess Victoria of Saxe-Coburg. She was born in Kensington Palace in London on May 24th, 1819. At the age of 18, following the death of her uncle, William IV in 1837, Victoria succeeded to the throne and was to rule for 64 years during one of the most significant periods of change that the United Kingdom had ever witnessed. Although the Industrial Revolution had started perhaps 75 years earlier with the coming of water-powered cotton mills such as Cromford, Derbyshire (1771), the United Kingdom's most successful economic period was doubtless in Victorian times. The railways of Brunel and others spread nationwide, innovative machines, products and processes of all kinds were developed, plus of course the expansion of influence worldwide through the creation of the British Empire. Whilst much of this development would not be acceptable today, at that time there were many who benefited from the generation of great wealth, sometimes to the benefit of the working class, but of course, sometimes not. Throughout this period, Queen Victoria reigned until her death in 1901 to be succeeded by her son, Edward VII. This picture was taken from an exceedingly rare CDV from the late 1850's. It features an art print of a photograph of Queen Victoria, and her husband, Prince Albert. 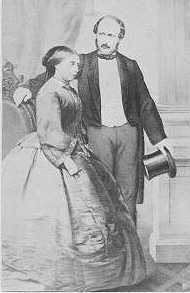 Victoria's deep love for her husband Prince Albert is well known and when he died on 14th December 1861, of typhoid at Windsor Castle, Victoria was devastated. 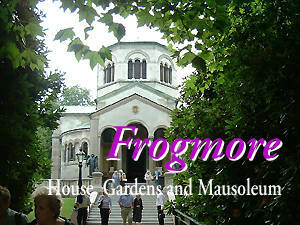 Within four days she had ordered the Frogmore Mausoleum to be built at her own expense in the gardens of Frogmore House. The Mausoleum was to contain his human remains, and to be her future resting place next to him. 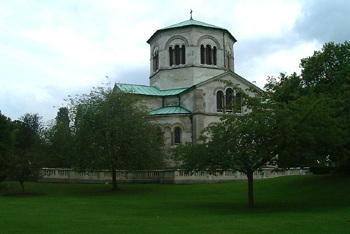 It is thought that Victoria's idea for a mausoleum could have been inspired by a small Gothic building built at Claremont by Prince Leopold of Saxe-Coburg and designed by Papworth and Pugin. Originally intended as a tea-house for Princess Charlotte, it became a shrine to her memory after she died in childbirth in 1817. It survived until the mid-1920s. In 1844 Prince Leopold's brother died, Duke Ernest I of Saxe-Coburg-Gotha. 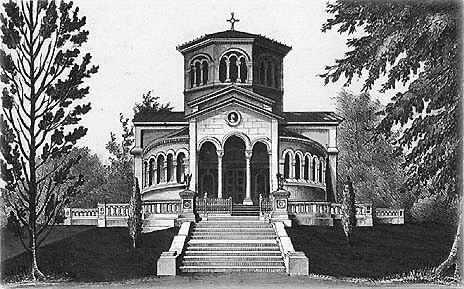 The Duke's sons, Albert and Ernest, planned a mausoleum at Coburg. This was designed by the architect Eberhardt and Victoria is said to have thought it "beautiful and cheerful" and it is likely that Victoria chose to erect a similar mausoleum in Windsor for herself and her beloved Prince Albert. 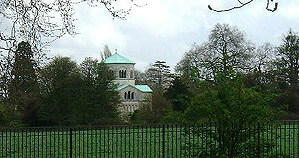 An earlier mausoleum had already been built for Queen Victoria's mother, the Duchess of Kent, on a rise, beside a lake, a short distance from Frogmore House. 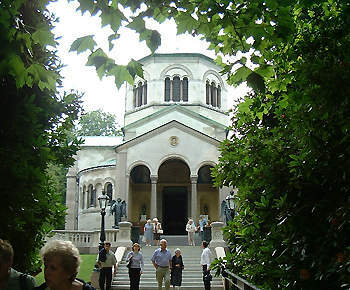 The Royal Mausoleum at Frogmore was designed by Ludwig Gruner of Dresden, the designer of the earlier mausoleum. It is shaped as a Greek cross and has an external diameter of 70 feet. (21 metres). Work commenced in March 1862, just three months after Prince Albert's death. Although the building could be consecrated in December 1862, it was a further nine years before the interior decorations were completed in August 1871. The Royal Mausoleum is a remarkable example of Victorian building, sumptuously decorated inside with inlays of coloured marbles from the UK, Italy, Greece, France, Portugal (Emperor's Red), Africa and North America. After Victoria's death, the new king, Edward VII, put in hand new stained glass windows, interior repainting of the dome, and presented the large bronze lamps at the entrance. The tomb itself was designed by Baron Carlo Marochetti. 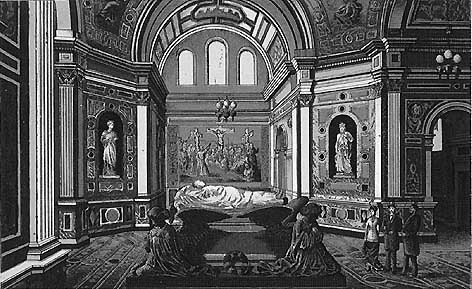 The recumbent marble effigies of both the Queen and Prince Albert were Marochetti's last works and although completed at the same time, the effigy of the queen was not brought to Frogmore until after her funeral. The sarcophagus was made from a single piece of grey Aberdeen granite, said to be the largest block of flawless wrought granite in existence and was the fourth to be quarried for the purpose, the earlier three attempts being found to be flawed on the underside after being cut from the quarry at Cairngall. In the following ten years Queen Victoria's popularity faded as she took almost no part in public life but, with time, her royal engagements increased and during her Diamond Jubilee in 1897 huge crowds gathered in the streets of London to witness the great procession in her honour. The Queen is said to have had tears in her eyes as the crowds roared their loyalty as she passed by. 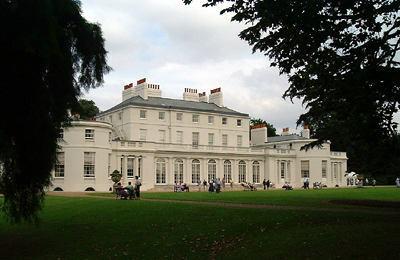 The beautiful Frogmore Gardens surrounding Frogmore House and Mausoleum were designed in 1793 by Major William Price. east of the Long Walk, not far from Windsor Castle. Enter the Long Walk from Park Street at the eastern end of Windsor High Street. Frogmore is normally well sign-posted during open days. Look for the distinctive yellow AA signs. 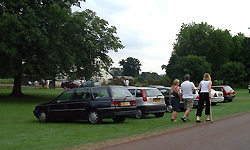 Parking is available in the Long Walk adjacent to the entrance to Frogmore. NB Cars are not normally permitted in the Long Walk so enjoy this rare opportunity! Windsor Central Station (aka Windsor Royal Station) is served by Paddington Station in London and the Great Western railway from the West, Bristol and Reading direction. From the north of England train services also run into London via Oxford, Reading and Slough (change here for Windsor). This station is closer to The Long Walk and Frogmore, but it is still a ten minute walk. On leaving the station turn right towards the statue of Queen Victoria and the Guildhall. Pass the Guildhall and continue straight ahead into Park Street. At the end of Park Street enter The Long Walk - superb views to the Copper Horse and towards the castle itself - proceed down the hill where you will come across the entrance to Frogmore on the left, clearly signposted. Trains also serve Windsor from Waterloo Station in London, arriving at the Windsor and Eton Riverside Station. When traveling from the south of England it may be preferable to travel to Windsor via Clapham Junction and/or Staines.This is a longer walk, up the hill around the castle, thereafter the directions are as above from the Queen Victoria statue. Please note, Frogmore may not be suitable for children under 8 years of age. A variety of charities benefit from these open days so where groups or coach parties are planning to visit, the organisers are invited to contact the relevant charity for that day for further details and to assist with planning. The Mausolea and Monuments Trust is a charitable trust, founded in 1997, for the protection and preservation for the public of Mausolea and Sepulchral Monuments situated within the United Kingdom of Great Britain and Northern Ireland. 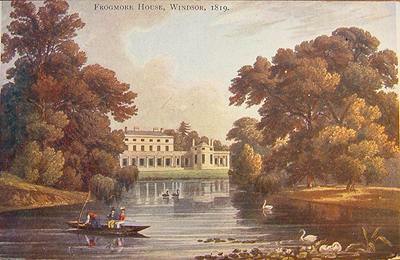 Some additional history about Frogmore House.